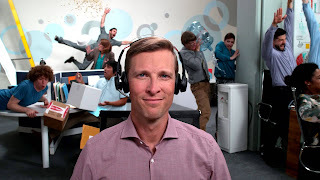 Plantronics just released this commercial for their Voyager FOCUS UC headset. Impact Creative, a Bay Area production agency, decided to take "focus" to the next level by employing the Phantom Flexk4K high speed camera. Filming at 750 frames per second, IMPACT choreographed a "comedy of errors" involving office workers in simultaneous disaster around one very focused co-worker. At 750 fps, one second of real time action equates to approximately 30-seconds of slow motion playback -- the length of the commercial. The Director, David Sieburg said, "This was a bizarre undertaking because the entire commercial was one scene, one camera angle, and all of the ridiculous action needed to take place in a one second window. The actors had to hit their marks absolutely perfectly -- within milliseconds -- for the total cacophony of events to fill the screen." The real time outtakes are nothing short of comedic as the entire set explodes with spilling water, flying papers, and crashing bodies. But in slow motion, the scene becomes almost graceful as you explore an unfolding scene of chaos. Impact Creative said the 7th attempt hit the nail on the head.